This is one of the loveliest ornamental onions, its inflorescence consisting of dozens of small star-shaped flowers united to form a globe-shaped cluster. To achieve a successful visual effect, 10 to 15 bulbs should be planted close together. The narrow blue-green leaves also have a certain ornamental value. Usually naturalizes well in moderate climate zones. Excellent for cutflowers as well. In flower beds, perennial beds and as fresh cut- and dried flowers. It is normal that the foliage already starts to turn yellow/brown before the flowers have finished blooming. Let them die back naturally (to build up energy reserves within the bulb) and only remove the dead foliage once it has completely separated from the bulbs. You can either deadhead the finished blooms or allow them to dry and let the seeds be blown to other parts of your garden. Eventually they too will produce new alliums. Even the dried flowers are still quite decorative for a while and after 4-6 weeks you can easily pull them loose (don't force it) and bring them indoors as a dried bouquet. Leave the bulbs in the ground and fertilize them with bonemeal, bulb booster or 10-10-20 early every Spring when the foliage begins to emerge again. Divide and replant them early Fall after they become overcrowded (and flowering diminishes) after 8-10 years. (Besides the species itself); 'Lucy Ball' (deep purple) and 'Purple Sensation' (deep purple). Many hundreds of Allium species exist, but only a modest few have made a name for themselves as garden plants. 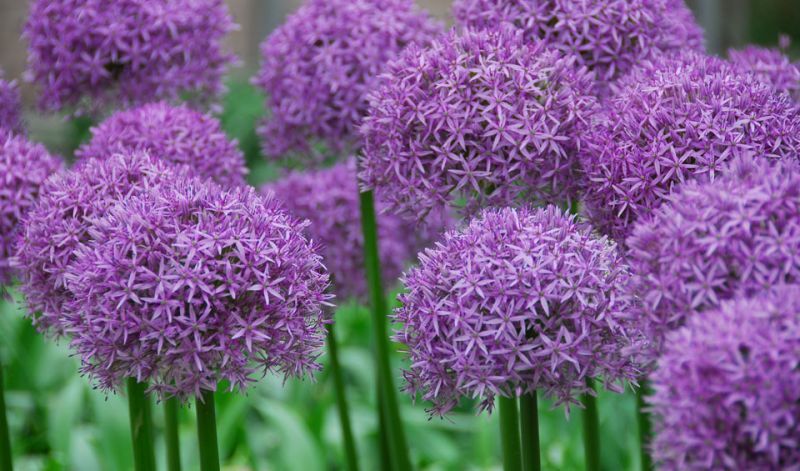 The genus, Allium also includes important plants used for human consumption such as onions, leeks, shallots and the familiar cooking herb, chives.